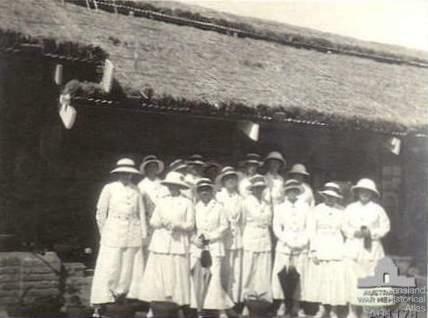 Queensland and Victorian nurses at Poona, India, 1918. Group of fifteen Australian nurses outside King George War Hospital. This hospital opened in 1917 and was staffed by Australian sisters under an Indian Army Regular Matron, Miss Nancy Harris. Back row, left to right: Warner (Qld); Hocking (Qld); Flae; Somerville (Vic); Overell (Qld); Russell (Qld); Wiltshire (Qld). Front row: Butler (Qld); McGeoch (Vic); Lancton (Vic); Staff Nurse Irene McPhail (Vic); Munroe (Vic); Hockings (Qld); Durack (Qld); Harris (Qld).